Damn the free coffee; it kept me up till 6am Monday. Damn the airconditioner in the office; it gave me a flu. I bought Alex’s 17″ monitor on Tuesday. Realizing that my keyboard was of the big-sized-connector variety, I headed over to a computer shop nearby and bought a Logitech NewTouch Keyboard. Damn it too; the Samsung one was even sissier, but the shop hadn’t much choice. I like my keyboards with tactile, resounding TAK TAK TAK when I type. At least it was cheap; otherwise, I’d never have bought a Logitech. When typing fast, some letters would just disappear. At least it had an armrest. 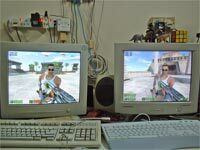 This entry was posted in Geek, Pictures on July 1, 2004 by 2konbla. heh. I missed those classic keyboards too.